Western Kingbird - poor record shot of bird at disatnce, but diagnostic black uppertail with white outer feathers rather striking on this individual. Feeding in a sheltered spot at the rear of the field behind the Central Congregational Church in New Salem, Franklin Co., November 11th, 2011. After a very mild week, the day became one of brisk Westerlies and signficantly colder than of late. 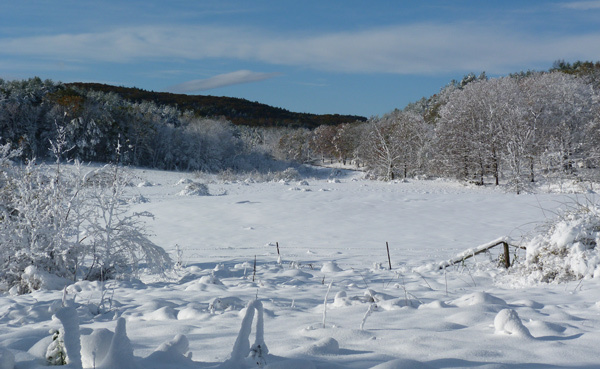 Being a national holiday we had plans for a family hike into North Quabbin. Having dipped miserably on the reported Western Kingbird at New Salem yesterday, I couldn't resist swinging by there on the way to Gate 35. Fortunately, Jacob Drucker and others were on South Main Street, New Salem searching for the bird and it wasn't long before Jacob refound it feeding in a sheltered field behind the Congregational Church. Views were distant but good enough in the scope. A little later we were at Gate 35 at the North end of the Quabbin Reservoir and had a pleasant but bracing stroll down to the water's edge. Ten Bufflehead and a Common Loon were the only birds visible on the water, and two immature Bald Eagles drifted slowly SW giving reasonable views. 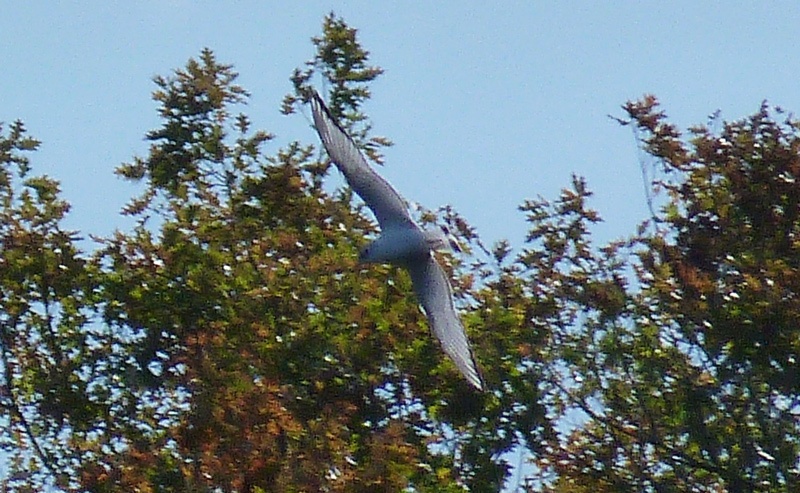 As we packed up an early lunch, a high flying raptor gliding south at speed caught my eye. One glance through the bins and I immediately yelled to Susannah "it's a Golden Eagle!!". Sure enough, we both had great views as it bolted south at speed without flapping its wings once! Personally, I've found Golden Eagle to be a rare bird in the Pioneer Valley having seen it just once before in Whately in October 2005. 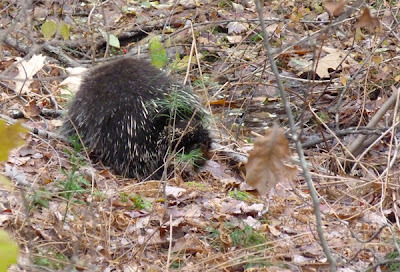 On the walk back to the gate, we had nice looks at a Porcupine on the ground rounding off a fine family walk in the Quabbin. Golden Eagle - high flying migrant gliding south, North Quabbin, Franklin Co., MA. November 11th, 2011. 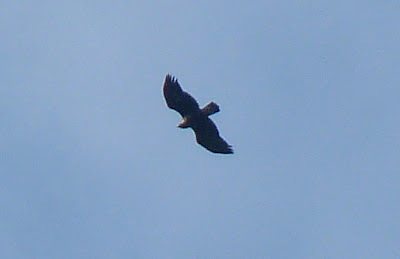 First identified by 'classic' Aquila flight shape and pale based remiges contrasting with dark brown underwing coverts. The golden brown nape was surprisingly striking, even though this bird was more or less overhead. 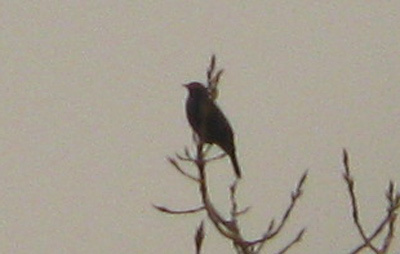 The dark terminal band to the tail and buffy undertail coverts were also notable. In view only for a few seconds at it glided south at terrific speed. 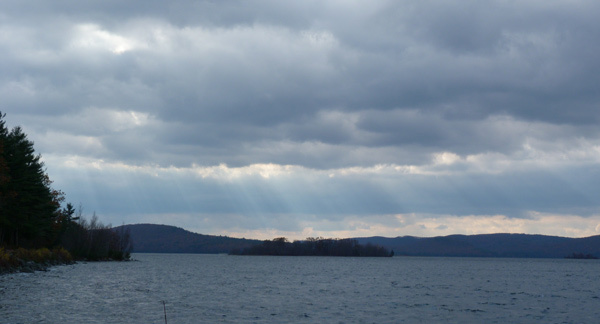 Quabbin Reservoir - North end on a raw day in November. North American Porcupine, North Quabbin, Franklin Co., MA. November 11th, 2011. Closer to home, the best bird of the day was a Pine Siskin over Main Road, Gill just after dawn. Overall, a fine day to be in Franklin County. MA - Gill in November (recent sightings). American Woodcocks have been pretty consistent at dawn on most mornings flying over Boyle, North Cross and Main Roads, sometimes flushing from the roadside. On the 7th, yet another Snow Bunting, this time flying over Lyons Hill Road, just off Main Road less than a half mile from our house. Predawn on the 8th saw a Northern Saw-whet Owl spontaneously give a drawn out 'whine' (or 'wail') call from a nice patch of mixed woodland along Boyle Street. Only seconds later, a Great Horned Owl began calling from the opposite side of the street. This is not a rare event in my experience, and over the last two years I've heard numerous Barred and Great Horned Owls calling back in response to my imitation of Northern Saw-whet Owl. In this case the Great Horned seemed to be responding to the real thing! Later, in mid-morning, our yard was suddenly full of birds: 10+ American Goldfinches on the feeders, a calling Purple Finch, 15+ Cedar Waxwings, and 4 Northern Cardinals amongst the rest. 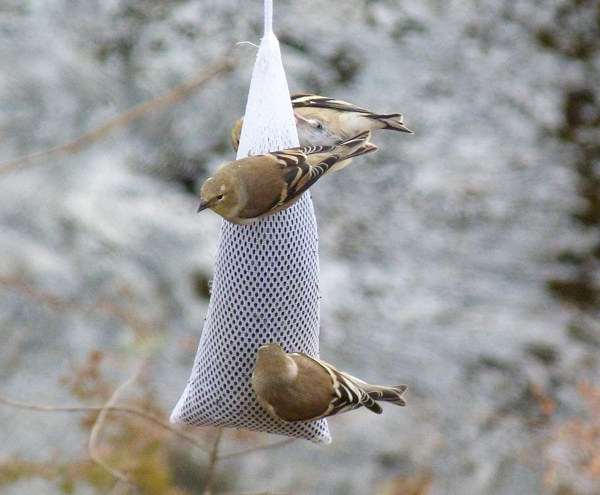 American Goldfinches - Gill yard, Franklin Co., MA. November 8th, 2011. Cedar Waxwing - Gill yard, Franklin Co., MA. November 8th, 2011. Eastern Chipmunk - Gill yard, Franklin Co., MA. November 8th, 2011. Dawn temperatures have gone from freezing at the weekend to currently mild, balmy and foggy. It couldn't be more of a contrast to last week. This morning (11/09) in the predawn fog a Catharus thrush called just once, which I think was a Hermit Thrush though I couldn't rule out Swainson's - but it's getting late for the latter. A Golden-crowned Kinglet spent much of the day in the yard, as did 10 or so American Goldfinches which have finally discovered the thistle seed feeders after a 'cool' two weeks or so. After a cold start (21 deg F) the day started with more Snow Buntings in Gill, this time a small flock moving SW over Boyle Street just after first light. Although I didn't get to do any 'proper' birding today, a smart male Purple Finch graced the yard provided in the middle of the morning. 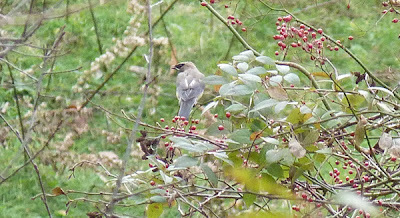 At least locally it seems to have been a slow autumn for this species with just one before this on October 22nd. That bird too, was a male. The Purple Finch, along with a handful of American Goldfinches, showed interest in the thistle seed feeders for the first time this season. 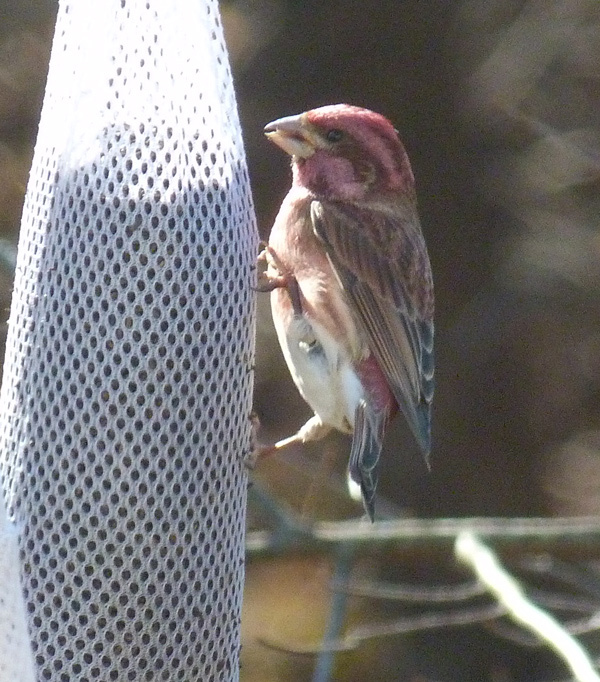 Purple Finch - male, Gill yard, Franklin Co., MA. November 6th, 2011. Similarly, a handsome male Northern Cardinal showed interest in the seed for the first time, despite the pair being present in the yard throughout the summer and fall. 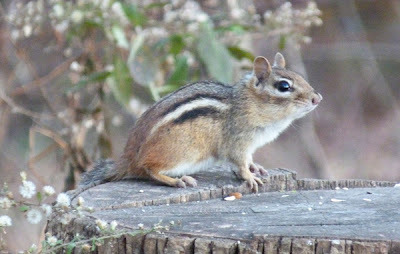 Otherwise, up to 10 each of Dark-eyed Junco and White-throated Sparrow on the feeders, plus regular visitors such as Downy Woodpecker and White-breasted Nuthatch. 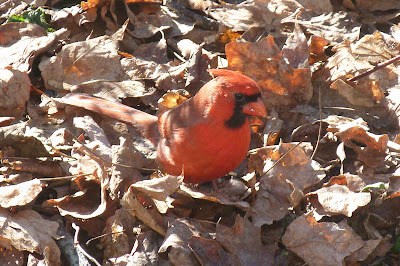 Northern Cardinal - male, Gill yard, Franklin Co., MA. November 6th, 2011. The day began in the nicest possible way with a Great Horned Owl calling well before dawn. A little later a Snow Bunting flew over calling and heading SW, especially audible in the predawn darkness. We've heard and seen Snow Buntings close to home before, but haven't had one directly over the yard until today. Belted Kingfisher - Turner's Falls, Franklin Co., MA. November 5th, 2011. In the afternoon, I took Matan for a ride down to the bike path at the Turner's Falls power canal. 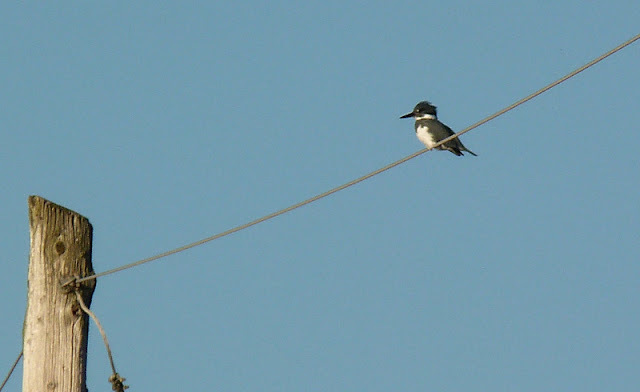 It felt good to finally get a shot of this lingering Belted Kingfisher, present for a while but a little camera shy. Scott Surner, Ian Davies and Jacob Drucker were there hoping to get a little more detail on the possible Brewer's Blackbird that I saw on Nov 2nd, but apparently didn't meet with success, nor did they see any Rusty Blackbirds. Returning home, Matan and I were greeted by the Great Horned Owl calling close to the house at dusk. Buffleheads - Turner's Falls power canal, Franklin Co., MA. November 4th, 2011. Made a quick run down to Barton Cove this morning hoping for scoters, and I wasn't disappointed. Four Surf Scoters, including three handsome males were loafing around in the middle of the cove. Just as impressive were 10 newly arrived Buffleheads, with other diving ducks including a Lesser Scaup, 3 Common and 2 Hooded Mergansers and an unidentified aythya which may have been a Ring-necked Duck. By late afternoon, the Buffleheads had moved to the power canal in Turner's Falls affording excellent views. Otherwise, nothing unusual amongst the 500 or so Canada Geese this afternoon. I couldn't stay late enough for the blackbird roost so have nothing more to add on the Rusty/Brewer's Blackbird from Nov 2nd. Surf Scoters - three males, the female being hidden in the center of the group. Barton Cove, Gill, Franklin Co., MA. November 4th, 2011. Fantastic birds, and always exciting to have 'sea ducks' on inland waters. Despite a breezy evening, the local Great Horned Owls were dueting at 19:00 hrs, clearly audible from our yard. 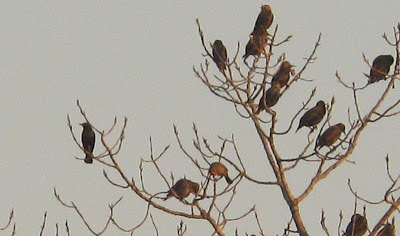 These birds have been very vocal of late and audible on most mornings and evenings, and sometimes throughout the night. Gill, Franklin Co, MA. 17:00 hrs on October 29th, 2011. Main Road can just be made out on the extreme right. There was a lot talk of how big and bad this storm was going to be. I'm often sceptical about these discussions but this one lived up to its formidable reputation. 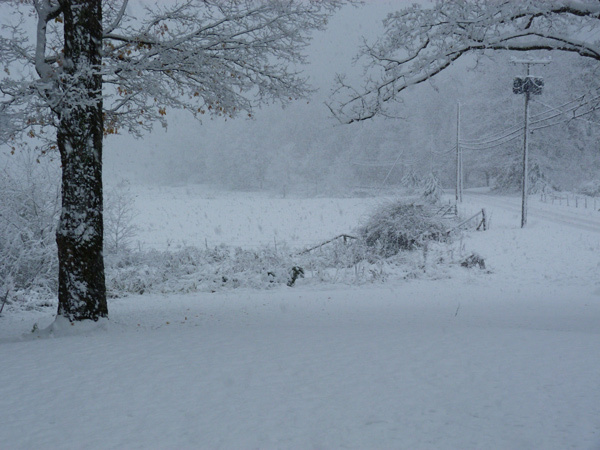 Snow began falling in Gill at about 15:00 hrs on Saturday October 29th. By 17:00 hrs we'd accumulated about 3 inches in the yard. As the snow came down in broad, heavy, wet flakes it was sobering to watch a Ruby-crowned Kinglet trying to glean insects from the undersides of willow leaves in the yard. 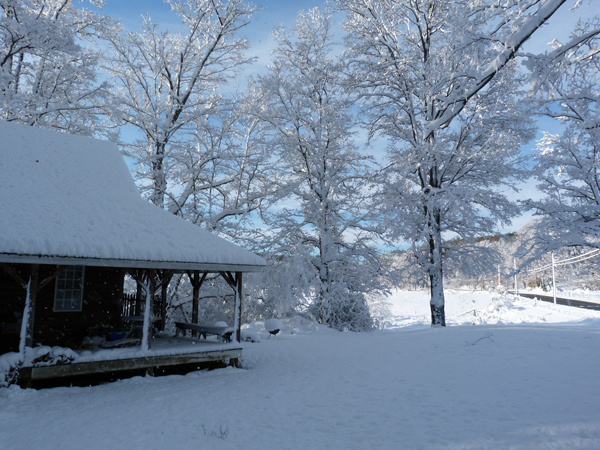 Snow continued to fall hard and heavy, and by 20:20hrs we'd lost power altogether in the house. We would have to wait three full days before it was restored, and I think we were the lucky ones! View from the yard looking SW towards Pisgah Mountain. 08:00 hrs, October 30th, 2011. 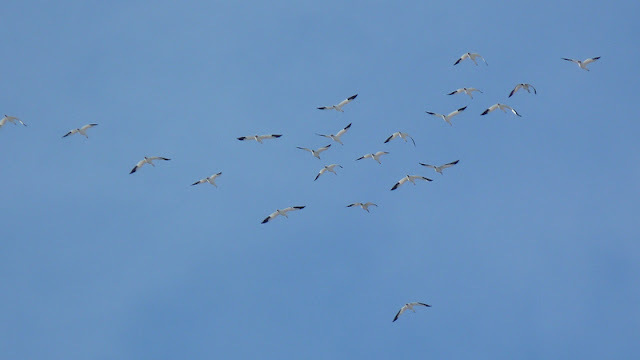 Snow Geese - 22 migrating SW over our yard (very cool! ), Gill, Franklin Co. MA. October 30th, 2011. But the storm, or rather post-storm, did produce some good birds including the first Snow Geese that we've had over the yard. At Barton Cove the first Buffleheads of the fall appeared plus another party of 12 Snow Geese moving SW. The Turner's Falls power canal was also quite productive with 2 Bonaparte's Gulls in with the loafing Canada Geese, an American Wigeon and 3 'Eastern' Palm Warblers, plus 6 Yellow-rumps. 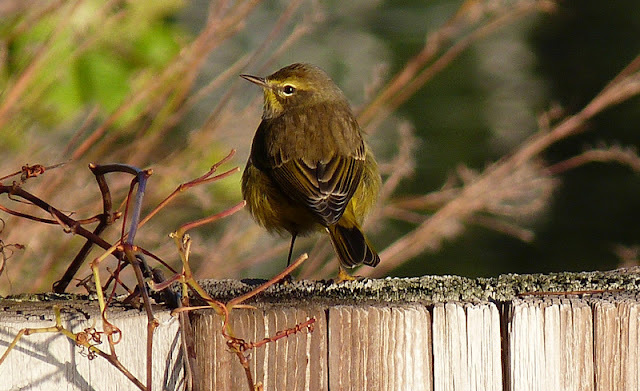 'Eastern' Palm Warbler - Turner's Falls power canal, Franklin Co., MA. October 30th, 2011. Bonaparte's Gull - first-cycle, Turner's Falls power canal, Franklin Co., MA. October 30th, 2011. Despite the presence of 650 Canada Geese at Barton Cove and Turner's Falls, there was absolutely no sign of the Pink-footed or any other unusual geese. Later in the afternoon, a Red-tailed Hawk and 4 American Herring Gulls migrated SW very high over the yard. American Tree Sparrow - Gill yard, Franklin Co., MA. November 1st, 2011. A Rusty Blackbird calling in the yard at dawn provided a nice opener to the month. 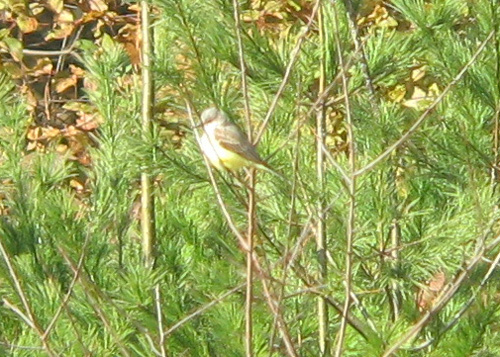 Unfortunately, it spent most of its time high in the maples and didn't come down to the feeders. 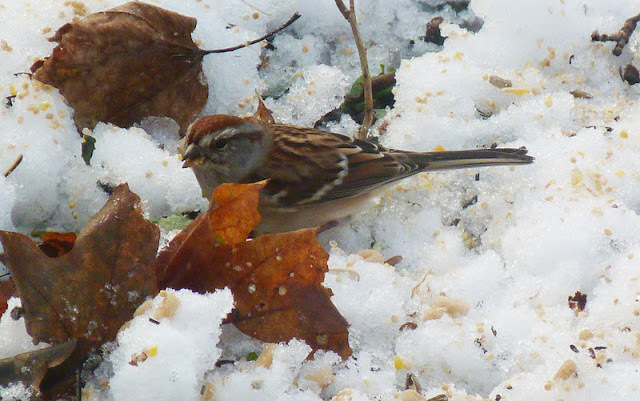 However, the feeders did produce our first American Tree Sparrow of the fall/winter feeding with about 20 Dark-eyed Juncos and 15 White-throated Sparrows. Despite morning temperatures being around freezing, up to 5 Yellow-rumped Warblers and 2 Golden-crowned Kinglets remain in the yard and surroudings. 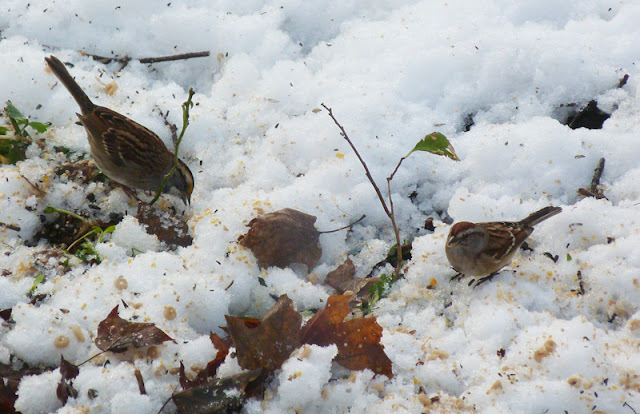 The same American Tree Sparrow with a White-throated Sparrow (left). Gill yard, Franklin Co., MA. November 1st, 2011. I checked the Turner's Falls power canal this evening looking for geese especially with the recent Pink-footed, Cackling and others in mind. Despite a decent sized flock of 750 Canada Geese, I couldn't find anything unusual amongst them. By 17:30 hrs, all but eight of the geese had left the canal, presumably heading out to the fields to feed. As the light faded, 15 Common and 6 Hooded Mergansers came into roost on the canal. In the mean time, small numbers of Starlings and Red-winged Blackbirds had been forming a pre-roost gathering in a leafless tree on the opposite side of the canal before dropping down to a small clump of Phragmites by the water. The views were reasonable but distant, and illuminated by late afternoon sun. I started checking the flock optimistically hoping for Yellow-headed Blackbird, a species which I've never encountered locally. One blackbird flew in and immediately caught my attention - Rusty Blackbird, perfectly appropriate for the place and time of year. 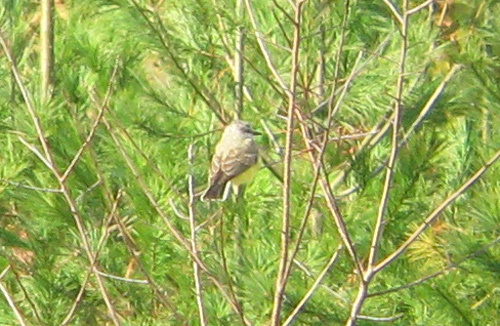 But it looked odd from the outset, and I immediately started to question my initial id. I couldn't ever recall seeing a 'fall' Rusty that was uniform, glossy black and completely lacking in any type of rufous feathering. It looked much as a male might do in late spring/early summer including the strikingly contrasting pale yellow eye. Surely, a Rusty Blackbird in November should show at least some rufous fringing to the feathers, much like this bird in our yard last November. Continued observation, albeit distant, revealed a complete lack of rusty tinged feathers. The only color (other than black) that I could detect at this range came from a hint of purple iridescence across the upper breast/lower throat. Brewer's Blackbird crossed my mind numerous times as I watched and digi-scoped, trying to glean as much information as possible. 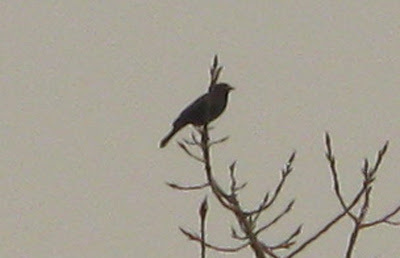 The bill looked also looked short for Rusty Blackbird, but given the distance I couldn't be sure. It remained in view for about fifteen minutes and during that time I never saw a hint of rustiness in the plumage. 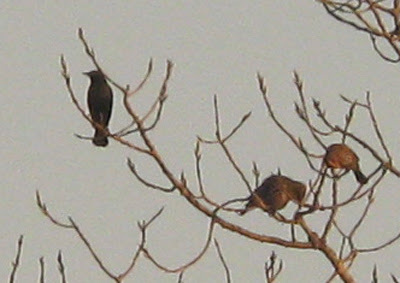 Rusty/Brewer's Blackbird - outer left of image, male with European Starlings and female Red-winged Blackbirds. Turner's Falls power canal, Franklin Co., MA. November 2nd, 2011. Extreme digiscope shot taken at about 250 meters range in late afternoon. Uniformly glossy black, with pale yellow eye and a hint of purple iridescence seen on the upper breast in late afternoon sunlight. 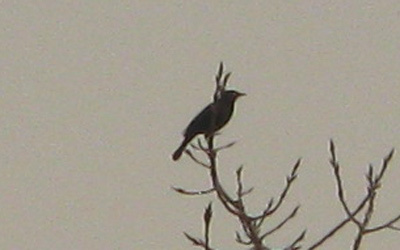 Rusty/Brewer's Blackbird - male, Turner's Falls power canal, Franklin Co., MA. November 2nd, 2011. Extreme digi-scope shot taken at about 250 meters in late afternoon. Uniformly glossy blackish with pale yellow eye. I may be to add more shots to these later. 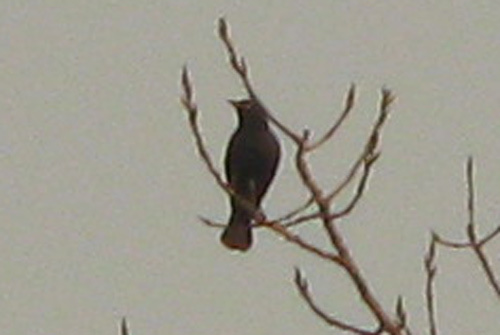 Since moving to the Pioneer Valley in 2005, I've only heard of one Brewer's Blackbird report, a bird found by Harvey Allen in Amherst in October of the same year. It's with some caution that I raise the possibility here, but it would seem that a male blackbird with uniformly glossy black plumage in November is likely to be a strong candidate for Brewer's. The burning question - can male Rusty Blackbirds completely lack rufous feathering in November, appearing like a breeding plumage male?